Half of Congress is leaving town. Their to-do list isn't going anywhere. Lawmakers left Washington Thursday to go on a month-long recess without tackling some of the biggest issues on the agenda. WASHINGTON — As of this week, House lawmakers are finished with congressional business until after Labor Day. That doesn't mean they finished all — or even most — of the congressional business left on their plates. 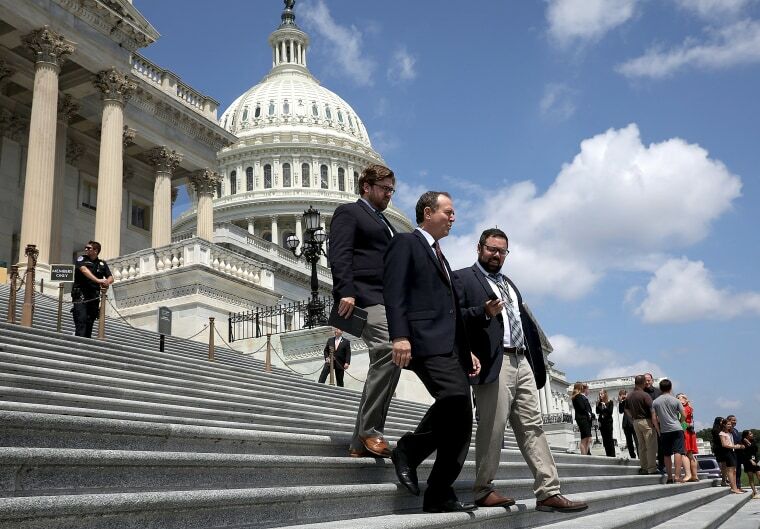 Members of Congress left Washington Thursday to go on a monthlong recess without tackling some of the biggest issues on the agenda, including legislation addressing immigration and family separation at the U.S.-Mexico border, Russia-related measures and a second tax bill. For its part, the Senate is planning to stay in session for most of August, with just a weeklong recess scheduled next week. But with House lawmakers back in their districts, there's not much senators can accomplish beyond confirming more of President Donald Trump's judicial nominees. It's been five months since the March 5 deadline the president originally set for Congress last year to pass legislation guaranteeing the Deferred Action for Childhood Arrivals program that Trump's administration has sought to end. So far, neither the House nor the Senate has been able to pass a bill making the program permanent. After more than a month of negotiations between moderate and conservative Republicans in the House, lawmakers failed to pass the GOP's compromise immigration measure in late June. At the time, Speaker Paul Ryan, R-Wis., left the door open asked if the House would pursue a more narrow bill targeting the separation of parents from their children at the U.S.-Mexico border. But Republicans leaders did not pursue any such legislation before the House left for August break. And there's no sign they'd like to revisit DACA or border security anytime soon. As lawmakers left the Capitol Thursday, the administration faced a court-ordered deadline to reunite 2,551 migrant children who were separated from their parents. Democratic lawmakers say that hundreds of children still remain separated — but there's been no real movement on any legislative fix for that problem, either. At the tail end of a month that included the president's controversial comments in Helsinki, the special counsel's indictments of 12 Russians accused of election interference, and the arrest of a Russian national for allegedly trying to affect domestic politics, House Republicans left Washington without passing any new legislation to address Moscow's U.S. influence efforts. The Senate has been more active on this front. In a move widely viewed as a direct message to Trump, the chamber recently unanimously approved a non-binding resolution, proposed by Senate Minority Leader Chuck Schumer, D-N.Y., that said the U.S. should refuse to make any former American diplomat available to Russian investigators — a measure that came up for a vote before the White House officially ruled out a Kremlin request to do just that. Senate panels, including the Foreign Relations and Banking Committees, are planning a string of Russia-related hearings next month, including sessions on the value of NATO, challenges ahead for U.S. policy toward Russia, the implementation of sanctions that Congress passed last year and Trump signed into law against Iran, Russia and North Korea, and the policy value of those trade penalties and other methods of addressing Russian actions. In perennial tradition, time's running out on some basic congressional housekeeping measures — the ones that keep the federal government open. When the House comes back into session in September, it will only have nine legislative days to figure out government funding ahead of the Sept. 30 deadline. While appropriators in each chamber have crafted different funding packages and passed some on the floor, the House and Senate have not yet come to a compromise and reconciled their bills. For several months, Republicans have been planning a second GOP tax overhaul measure. They're still in planning mode. House Ways and Means Committee Chairman Kevin Brady, R-Texas, told Bloomberg News last week that they expected to release an outline of their proposal during the August break, and to vote on the proposal when lawmakers return in September. Before the House left for recess, Ryan told Fox News that “making the tax cuts permanent” is still among the top priorities for Republicans when they return to the Hill this fall. But this is one issue where the Senate — where Republicans hold a razor-thin majority — could put the brakes on any movement. Both chambers passed bills earlier this year to overhaul how Congress deals with sexual harassment claims on Capitol Hill. What they haven't yet done is make a deal to pass some combination of the two measures. House and Senate staffers have been meeting weekly to negotiate a compromise, but sticking points remain, leaving the talks deadlocked. House negotiators say that their chamber has passed a stronger bill than the Senate's measure, which did not include an independent investigation process created in the House version, and defines harassment in a more narrow fashion. And the Senate bill only holds lawmakers personally or financially liable for any substantiated case of harassment, according to the office of Rep. Jackie Speier, D-Calif.,who is involved in the talks — while the House measure makes members of Congress liable for both harassment and discrimination. Talks are expected to continue at the staff level into August, but negotiators don’t expect any breakthroughs during recess while half the members are back in their districts. The best chance of progress, say some negotiators, is the possibility that an agreement could be attached to a must-pass government spending measure this fall. The House passed a legislative package made up of 58 individual bills in June to address the opioid epidemic, but the Senate has not yet voted on their own legislation. Four committees — Health, Education, Labor and Pensions, along with Judiciary, Finance and Commerce — have all passed various proposals of their own to deal with the crisis, but GOP leadership has not yet scheduled time to bring those bills to the floor. Senate HELP Committee Chairman Lamar Alexander, R-Tenn., is currently leading the effort to package together dozens of opioid bills approved by the four Senate committees. The Senate set itself a flexible deadline: Bring a legislative package to the floor by Labor Day. That could still happen. Don Stewart, a spokesman for Senate Majority Leader Mitch McConnell, told NBC News an opioid legislative package remains a top priority, and the goal is still to bring the measures to the Senate floor sometime during the extended August working period. When McConnell announced in early June that he was canceling most of the Senate’s annual August recess, he did mention opioid bills as a priority for August. Of course, the Senate now has another priority competing for time and attention over the next few months: The process to confirm Supreme Court nominee Brett Kavanaugh.